In the first episode of Bundyville, “The Battle,” we learn the Bundy family’s story as it appeared in the national media. In 2014, Cliven Bundy, the ranching family’s patriarch, was in a dispute with the federal government over grazing fees. When federal officers confiscated Cliven’s cattle, it was the predictable culmination of his long refusal to pay his overdue bills. But Cliven’s response was a shocking triumph of law-breaking, as he ordered his supporters to surround the officers at gunpoint. The cattle were soon returned to Cliven and no one was arrested. In 2016, a second standoff took place when Cliven, his sons Ryan and Ammon, and their posse of armed militants occupied Oregon’s Malheur National Wildlife Refuge. When, over a month later, they were arrested by federal agents, it seemed the Bundy family might finally be made responsible for their crimes. But Ammon was acquitted for his actions in Oregon, and the government prosecutors so thoroughly botched their case against the Bundys’ regarding the 2014 standoff that the judge declared a mistrial. In one of the most bizarre legal and political stories of the century, the Bundy family walked free after instigating two armed confrontations with the government and inciting their followers to commit violence. The episode is riveting. For listeners like myself, who knew vaguely of the Bundys’ standoffs as they played out on the news but quickly forget about them, the first episode provides an entertaining recap that reacquaints you with just how absurd a story it is. But Bundyville is not about this story. Exciting as it may be, the first episode is meant to provide necessary context for the following six. Unlike the show’s host, Leah Sottile, we haven’t been writing about the Bundys for the past four years. Sottile is not interested in taking seven episodes to provide a lush retelling of what’s already publicly known about the family. Instead, Bundyville is an exploration of how the Bundy family came to be, why a family like theirs resonates with so many in America today, and where they are headed next. These are interesting questions to ask since much of the Bundys’ story is so hard to make sense of. Under close scrutiny, the family’s ideology is hard to explain. Cliven Bundy is extremely distrustful of the US government, to the point where he believes that it has an explicit objective to incarcerate him, or at least prevent him from ranching. He holds outlandish views about the government’s right to own property based on a nonsensical interpretation of the constitution. He believes his actions are part of a religious prophecy that has been rejected by the Mormon church. And yet, he and his sons hold a fanatical and growing base of supporters who are willing to point their guns in whatever direction they’re asked. The bulk of Bundyville – episodes two through five – recounts Sottile’s quest to explain the Bundy family’s ideology. The second episode, “The Bomb,” and the fifth, “The Followers,” consider historical explanations for the Bundy family’s mistrust of the government. The third, “The Prophecy,” examines how their Mormon identity influences their actions. And the fourth episode, “The Living Room,” features an interview with Cliven Bundy himself, allowing him to explain his political motivations. This middle section of Bundyville feels somewhat lacking, because what quickly becomes apparent is that no coherent ideology can explain the Bundys’ actions other than that they consistently act in their own interest. Cliven Bundy touts the law and the constitution as a source of authority, yet as Sottile points out time and time again, he refuses to consider that his interpretation is inconsistent with the rest of the document; nor will he ever acknowledge that another interpretation might be possible. Further, he uses his devout Mormon beliefs to explain his actions, but ignores the Mormon church’s disavowals of those actions. Even the most reasonable explanation that Sottile provides, that the family’s historical mistreatment by the federal government explains their behavior, feels — for reasons I will touch upon soon — unsatisfactory. As Sottile painstakingly details why the Bundys have a good reason to distrust the government, it can sound like she’s searching for a justification rather than an explanation for the Bundy family’s beliefs. Living along the Nevada border after the Second World War, their family was subject to the radioactive fallout of nuclear bombs tested in the nearby desert. This mistreatment, and the government’s subsequent lies about the fallout, is the basis for a legitimate grievance, but it is not the basis of the Bundys’. Their first armed confrontation with the government was about land-use rights, and the second was a more abstract call for the restoration of individual freedoms. Sottile provides a more coherent justification for the Bundys’ actions than the Bundys’ can themselves, but it’s unclear what she accomplishes by doing so. This speaks to the larger shortcoming of this portion of Bundyville. What felt like an interesting question at the end of the first episode — “Why do the Bundys believe what they do?” — is revealed as the wrong question to ask. By the fifth episode’s end, a better inquiry would be: “Seeing that they are so incoherent, why do the belief systems of extremist groups matter at all?” Even if the Bundys did have a coherent political ideology, Sottile fails to address what that would change. After searching for an answer as to how the Bundys came to be, Sottile settles on showing them for who they are. They are violent, they are greedy, and they are not going away. 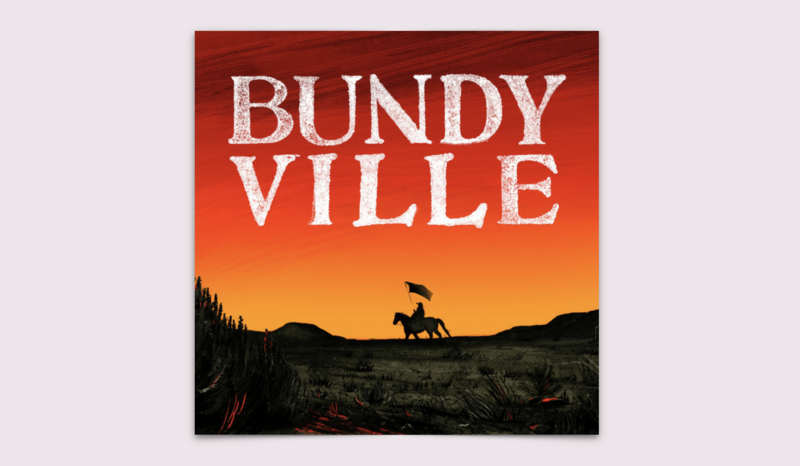 By the show’s end it becomes clear that this podcast’s title, Bundyville, is not a reference to the ghost town in the family’s past, but the space they occupy in today’s America — a space “where there is no difference between truth and belief,” and disagreements are settled by whoever is most willing to commit violence.